Weezer Releases “The Teal Album”, Co-Headlining Tour w/ The Pixies Kicks Off In March. WEEZER (THE TEAL ALBUM) IS HERE! 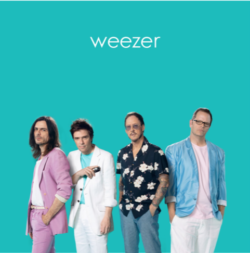 Weezer (The Teal Album) precedes the band’s forthcoming new album of original Weezer songs, Weezer (The Black Album), which will be released on March 1, 2019. Weezer (The Black Album) was produced by TV On The Radio’s Dave Sitek, with whom the band worked for the first time. The album’s songs were entirely written on piano by frontman Rivers Cuomo for the first time in Weezer history, creating some of the most satisfyingly awesome songs in the entire hits-filled Weezer catalogue. With band members switching up instruments in the studio, and choruses filtered through Sitek’s own encyclopedic musical references of everything from Gorillaz to Can to Pink Floyd, Weezer (The Black Album) is the bold next step in the winning streak of acclaimed albums they’ve released since 2014. The album’s current song, “Can’t Knock The Hustle,” recently became the band’s sixteenth Top Ten single at Alternative Radio.